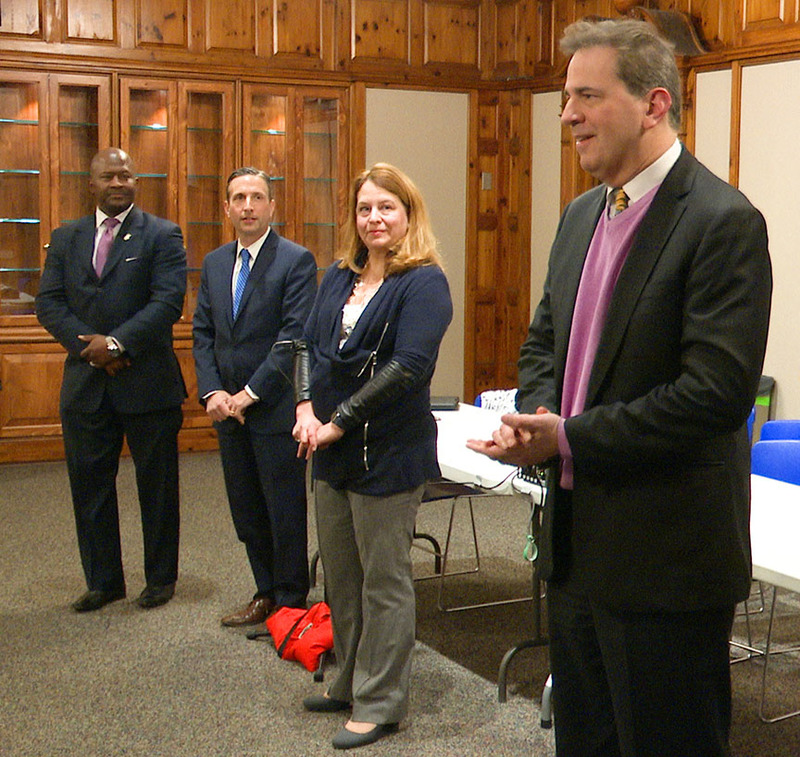 NORWALK, Conn. – Norwalk’s Democratic legislators talked sales taxes to support municipalities, tolls, school district regionalization and cost-saving measures at a forum Tuesday in City Hall. About 40 people attended the meeting. State Senate Majority Leader Bob Duff (D-25) and State Reps. Lucy Dathan (D-142), Chris Perone (D-137) and Travis Simms (D-140) answered questions for about 50 minutes. 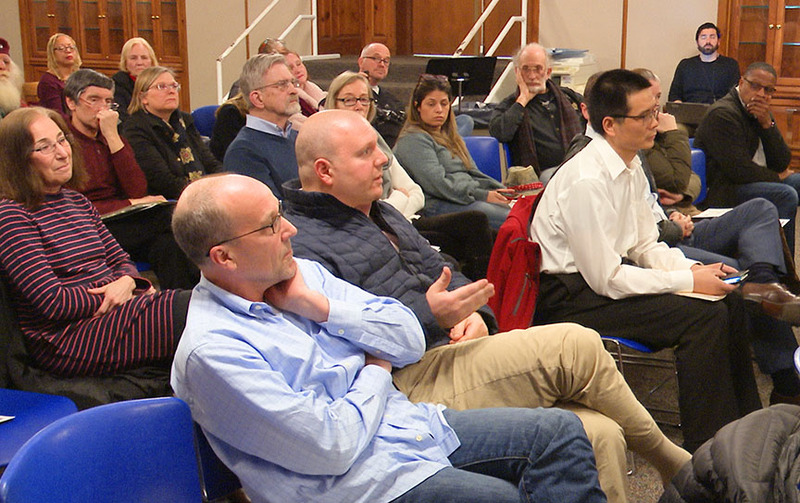 Chapman Hyperlocal Media Inc. Board Chairman Bob Welsh asked about a proposed bill that would increase the state sales tax by 0.5 percent and distribute the revenue to the municipality in which the tax is collected. By Welsh’s estimate, the proposal would generate at least $10 million in new tax revenue for the City of Norwalk. Duff said at the forum and again by email on Sunday evening that he hasn’t looked at the bill, a one-pager submitted by State Senate President Pro Tempore Martin Looney (D-New Haven). Looney is the most powerful Democrat in the State Assembly. Duff said he favors increasing Norwalk’s share of existing state sales tax revenue, dedicated to the City a few years ago in an agreement which he said gained $2 million in municipal funding. He said that figure was reduced as part of a compromise in forging the last biennial budget. The longtime legislator did not reply to a late Sunday evening email asking if an increase in Norwalk’s share of existing revenue could raise an amount equivalent to $10 million. The municipal revenue sharing program was enacted in 2015, according to the State website, which explains that the money is awarded to municipalities via grants, and the formulas have been changed. The current state general sales tax is 6.35 percent. According to data.ct.gov, the tax due from Norwalk 2011 retail sales was $121 million. Looney’s proposal also states that 60 percent of the revenue from a large regional shopping center – i.e. a mall – would go to the municipality in which it’s located. The other 40 percent would be distributed to contiguous municipalities. Expectations are that The SoNo Collection, a mall on West Avenue due to open this Fall, will generate $5 million a year in state sales tax revenue, Duff said, and he wouldn’t support the bill’s provision which distributes a portion of that tax revenue to adjacent wealthy communities. Earlier, Duff had explained that bills are in the proposal stage, generally concepts or ideas, a couple of sentences to start a conversation. One man called bills which would consolidate administration of small school districts unfair, part of “class warfare.” “Let’s come up with legislation where we lower the cost burden for every resident, we’re not pinning one constituency versus another,” another commented. It’s a “so-called civil war,” the first man said. He asked Duff why he was adamant about pushing Senate Bill No. 457. Duff and Sen. Cathy Osten (D-Sprague) proposed SB 457, which would require school districts with fewer than 2,000 students to become part of a regional school district. Duff said he’s received emails with innuendos and references to forced busing, although the bill – and two other bills about regionalization – would not force students to go to other schools. Research shows that school districts with 2,000 students or fewer are both inefficient and probably aren’t providing the children with services they need, Duff said, explaining that he chose 2,000 for specific reasons. Half of Connecticut’s school districts have fewer than 2,000 students and 32-39 have less than 100, he said, citing one case where there are four superintendents for three towns, because each town has its own lower school system and there’s a regional high school. In response to Duff’s comments about needing to cut costs, a man said that there are other ways that aren’t being considered because they’d be unfavorable to unions. “What bills have you submitted… that will lower the cost for every resident?” he asked. Duff said the man had a fair point and then highlighted cost saving measures the legislature has undertaken over the past several years, which cut billions in state spending. The workforce has been reduced by 16 percent, making it the lowest per capita since 1960, and the state is now funding its pension costs, he said, arguing that not funding the pensions for years has created the contemporary budget issues. “From a state government standpoint, we have made some major changes, I think,” Duff said, explaining that he brought up regionalization of services in the last biennial budget process but was rebuffed. “People just don’t want to” give up inefficient local practices, he said. Urban centers cover at least 90 percent of the social costs for surrounding smaller communities. “If you want to have that conversation let’s have that conversation because the City of Norwalk carries that for surrounding towns, and same thing for Stamford,” Duff said. Chris Bradley, director of the Norwalk Public Library, said she’s a “rabid Democrat” and wanted to know Democratic thinking on tolls. Virginia has 30-year plan to improve its transportation infrastructure, which will attract business but that takes planning as well as money, Perone added. “This conversation now is a tough conversation to have because it’s, we’re talking about how tolls impact people’s lives in real time how the state’s going to address, what kind of impact tolls are going to have on folks. There’s a lot, this is still being worked out,” Perone said. It’s “baloney” that the Transportation Fund has been raided, and, “We have put more money in transportation than ever before,” Duff said, as gas tax revenue has declined. Simms said he hasn’t formed an opinion on tolls but if they have to happen, he may favor “having them in the lockbox, make sure it goes to those municipalities to help pay down property taxes,” he said. The “baloney” happens every legislative session. STF revenue ends up in the General Fund,very much like the taxes for the Green Fund on your electric bill, the Tobacco Settlement money,bottle deposit money and even the new funds meant for faulty concrete…Toni Harp managed to snag part of that.The list is endless and there is not such thing as a “lock box”. Your toll money will vanish as quickly as most revenue does in this state once the Toll Authority is established. Connecticut does not have a revenue problem. It has a spending problem. Lets encourage our local Legislators to bring on more State taxes. Everyone knows more taxes is how we solve our decade long stagnant State economy/employment level. And more taxes are needed here in Norwalk to help keep our decade long Grand List stagnant even longer. There’s no reason to cut State spending. Or Norwalk spending. Why would anyone believe higher taxes are causing an Exodus from CT or an Exodus of long time homeowners from Norawalk. That’s just the stuff our kids learn in freshman college economics. It is so shameful that these politicians are refusing to address the cost side of the equation and insist on squeezing the struggling working class with even more fees, taxes and socialism. CT is not for the working class and has given every reason for retirees to flock out of the state. It is apparent now that the Democrat party is solely focused on placating to the welfare roles, ever increasing sanctuary population and big labor. The state is pivoting to a point of no return. Farricker’s theater is Norwalk’s version of Hartford’s Yard Goat stadium. $71 MILLION is sort of what it cost to build the stadium and it has $4.6 million in annual debt but only $1 million in revenue is generated. What is wrong with that math? Nothing! It is state money,your money,so no worries. Unless and until this state gets wise, there is no hope. Connecticut is basically insolvent and the pain is going to get worse. Increased taxes. More “fees”. Fewer services BUT the same fat paychecks,benefits and pensions for state and local workers. Once again you may want to consider facts for a change. The Grand List is NOT stagnant and actually its far from it. Also Norwalk is NOT having an Exodus of long time homeowners. FACTS do matter please try them. Perone is either extremely ignorant, or he’s lying. Bob Duff is being disingenuous. The Stf has been raided to the tune of OVER a billion dollars.How can you not know that? He should be fired for lying or stupidity. Bob Duff forgets to mention there is also a fuel wholesale tax which has grown dramatically over the years to make up for the decrease in gas retail sales tax…VERY DISAPPOINTED With Both of these gentlemen..
Sure as sheet this P Iberman says something and Ron Morris attacks him. It gets old – I dont know PIberman from Ron Morris or even Rusty Gaurdrail (catchy name I might add) or anyone else who posts original thoughts here but it’s sad- give it a break. I looked up Grand List so I could pose a simple question. According to a state of CT informational web page “ The Grand List is the aggregate valuation of taxable property within a given town“. So our Grand List grew by 18% and this makes us happy. I see it as we as taxpayers just got an 18% tax bill. And 260 commercial property owners are mad as hell. But I started this thought after reading a thread going way back to March 13. Maybe a lot has changed since then. And personal property valuation has naturally gone down. Depreciation is a pretty easy concept to grasp.